Does Millionairium follow its promise of getting each client to the first page of Google? Shawn Rosen, president of Koi Market says they do. I recently interviewed Rosen about Koi Market’s journey to the top of Google. The following video is the result. We asked CEO of Millionairium Ali Husayni what SEO techniques he’s used to raise Koi Market’s rankings on Google. Millionairium’s Manager of Operations Saeed Khosravi went into more detail about how the Millionairium team helped Koi Market move up the Google ranks. Our team had never had a ProStores client before Koi Market, though we had other eCommerce SEO clients based on Magento and Prestashop. WordPress, as we’ve said before, is integral to our SEO campaigns. Embedded blogs help our customers use content creation as a means of building keyword density in an organic, logical way. 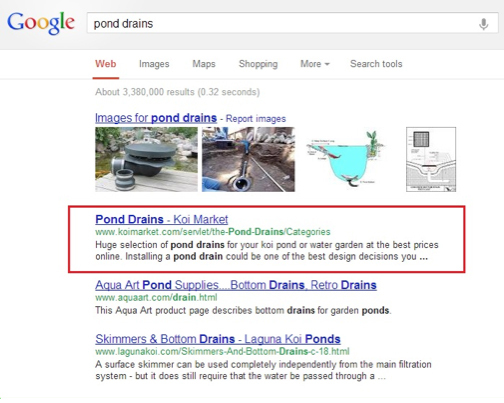 But that wasn’t the only problem our team had helping Koi Market improve its rankings. Our team optimized the homepage, the static blog pages and some of the most important “category” pages. We also initiated our link building campaign by submitting Koi Market to approximately 240 websites and creating more than 1,000 quality backlinks. The whole SEO campaign took three months, from February to May 2012. The proof is in the proverbial pudding: the companies that take SEO seriously are rewarded with higher rankings on Google and when people find your site on Google, your leads and sales go up. If your company is struggling to increase its revenue, we’d like to discuss ways we could get you ranked at the top of Google for many of the keywords related to your business. Our team uses a time-tested SEO strategy to improve your site’s rankings on Google. We strive to make your website popular and relevant by creating expert content, building links and steadily moving you up the Google search results organically. We also offer coaching and consulting to bring your business the support it needs to grow. Feel free to view our other testimonials by current and past clients. I think getting on Google\’s first page is not an easy task but on continuously working on it following good strategies you can achieve that . You should follow good link building techniques , I hope this will be succeeded.